Burdette & Rice is a Dallas-based law firm that specializes in litigation over trusts, probate, and estates. Active on social media, the company has passed the important milestone of 18,000 views on Google+. The reality today is that consumers go first to the Internet to learn about anything, including legal issues. Burdette & Rice of Dallas, Texas, a team of dedicated probate attorneys at http://www.dallasprobateattorneys.com/, is proud to announce an important milestone on the social media network, Google+. The company has just topped 18,000 views of its Google+ page. To view the company's Google+ page, visit their website at http://www.dallasprobateattorneys.com/. Then, scroll down to the bottom footer, and click on the Google+ icon. Alternatively, one can go directly to Google+ at https://plus.google.com/113348598495908876736/posts. Burdette and Rice is known as a law firm that promotes education and outreach. 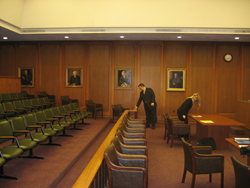 Its attorneys are frequent presenters at legal conferences in and around the Dallas area, generally on their areas of expertise such as probate, estate, and trust litigation and disputes. The firm uses social media such as Twitter and Google+ as outreach tools for the general public, and posts both on legal topics (primarily based on its blog efforts) as well as general happenings around the Dallas area. The reality is that many people turn to social media for local information, and by mixing both serious legal information with fun information on happenings around Dallas, the firm is able to engage interested parties as well as entertain them. A sample post is entitled, "Texas law provides special procedures for missing wills," and that summary points to a more detailed discussion on the firm's blog at http://www.dallasprobateattorneys.com/will-contests-texas-law/. Burdette & Rice, PLLC is a probate, estate, and guardianship dispute law firm, with lawyers dedicated to listening to their clients, being fully present to them, and advocating their clients’ positions in the simplest and most persuasive way possible. The law firm employs well-respected probate and estate lawyers in Dallas, Texas. Clients come to Burdette & Rice to contest a will in Texas, work on complex inheritance litigation and disputes, and even to litigate disputes over powers of attorney, guardianship and trustee issues all based on Texas law.